WTF can I do to buy stocks? Many of us keep most, if not all, of our savings in cash (or in a low-interest savings account that’s basically the equivalent to holding it in cash). The benefits of cash are pretty straightforward: it’s easy to access, for one. However, the fixed value of cash also has a downside: due to inflation, which exists in every major economy, your cash becomes worth less over time. Yes, you still have $10,000 (well done you), but that $10,000 will buy fewer things over time as inflation pushes prices up. You could invest in bonds to help protect you somewhat from inflation, as bonds typically pay an interest rate that roughly compensates for the rate of inflation – so your $10k shouldn’t decline (much) in value (interest rates are heavily influenced by inflation, and vice versa). But what if you actually want to make money with your money? You could start a business – but that’s a pretty big deal. Another option is to instead invest in others’ businesses – and stocks offer an easy way to do this. Over time, the health of these businesses (e.g. the stock market as a whole) tends to be closely related to economic growth. Historically, the economy has always grown (partly thanks to inflation, which pushes up the value of goods and services) – which is, fundamentally, why stocks are viewed as a good long-term investment (long-term usually means more than 5-7 years). The downside is that investing in individual businesses is risky. A stock price is based on the market’s expectation of the company’s future profits – and sometimes investors get too optimistic. Lots of unanticipated factors – from poor management to bigger issues like a slowing economy – can hurt a company’s performance. The risk in investing in a single company is relatively high. Therefore, to minimize this risk, people are generally encouraged to invest in a wide range of companies. By spreading out the risk, investors hope to benefit from the higher returns stocks generally offer (relative to cash and bonds) without overly exposing themselves to any one company. Those new to investing may find it a bit daunting to invest a big chunk of their money in stocks right away, especially as stock prices are currently near record-high levels. In order to decrease the risk of buying stocks at the wrong time, some investors employ a technique called “dollar-cost averaging” (DCA) where they commit to investing a fixed dollar amount on a regular schedule (e.g. monthly). After a period of time – say 18 months – they will have invested all the money they planned to in stocks, having essentially paid the “average” price of stocks over those 18 months. One of the benefits of such an approach is that the investor inherently purchases more stocks when prices go down and fewer stocks when prices go up, given that they’re investing the same dollar amount each month (it’s just math: $100 invested in stocks priced at $10 buys more stocks than $100 invested in stocks priced at $15). ✅ Who is this good for? This approach may be good for investors who want to smooth out the initial risk of buying stocks. Once you’ve determined your investment strategy (e.g. you want to own $10,000 worth of stocks) then you could buy the lot as soon as possible. After all, there’s a reason that you’ve determined it’s appropriate for you to own some stocks – so why not put that plan into action? Also, evidence suggests that the “all-at-once” strategy performs better than dollar-cost averaging most of the time (essentially because the stock market goes up most (but not all) years, and so the DCA team tend to miss out on some of the initial gains captured by the “all-at-once” strategy). 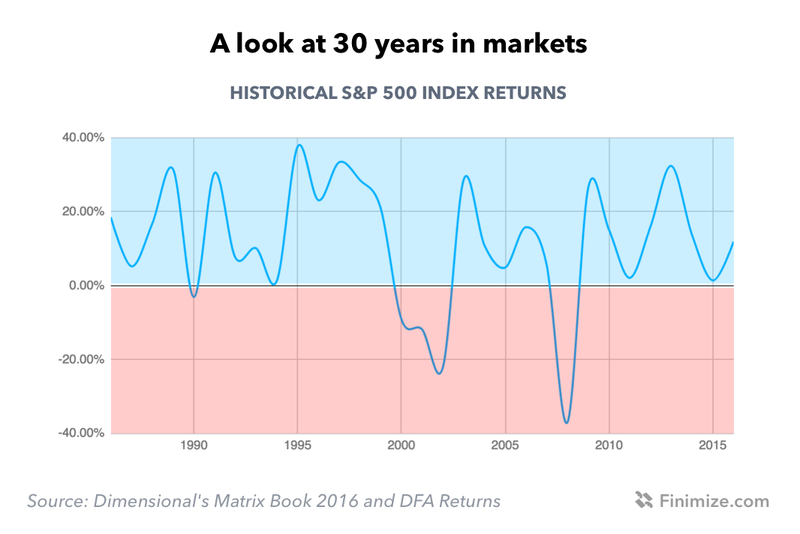 Markets have gone up most, but not all years. The longer your time horizon for owning stocks, the more likely you are to make money regardless of short-term swings in price (assuming that stock prices continue to rise over time) – and therefore the more appropriate an “all-at-once” strategy would be. If time’s on your side, you might consider it! By examining current stock prices and analysing the outlook for economic growth, interest rates, corporate profits and a variety of other factors, an investor might form an opinion on whether a stock currently offer fundamentally “good value”. In other words, are stocks priced cheaply relative to the profits that you expect companies to generate in the coming years? If so, this sort of investor would be more inclined to buy stocks. Successfully pursuing this strategy is challenging, not only because the investor has to be correct in their outlook for factors like economic growth and corporate profits, but also because stock prices have to react to those factors as the investor expects (which isn’t always the case; stock prices are prone to moving much more dramatically than the underlying factors, at least in the short term). Investors who think they’re more sophisticated and capable of predicting future stock prices based on underlying fundamentals. Technical analysis has a broad meaning, but it involves identifying price trends that some traders believe give insight into the future direction of a stock price (or the value of stocks overall). One popular strategy is “momentum trading”, which seeks to follow a trend. For example, if a stock rises by a greater amount each day, then technicians will view it as having strong momentum and might buy it. Similar strategies involve identifying key price levels, like when a stock hits a new record high (or low), which could suggest it will move further in that direction. Professional, algorithmic and amateur “day traders” tend to be the main users of these strategies. Alright! We’ve covered why investing in stocks could make sense for you and explored some of the more common investment strategies. Keep in mind investing is difficult and risky; your capital is at risk.